Over 1,000 people have already signed a declaration of intent which asks that the problems concerning the junctions of Rafal Rubí and l’Argentina with the main road would be resolved by making them on the same level as the main road. Add your support to this initiative by signing here. 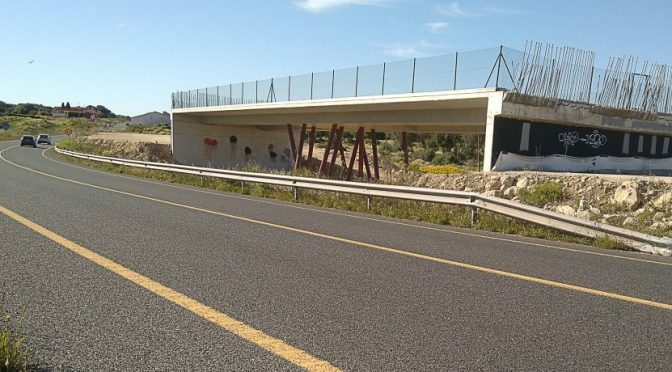 The three double level roundabouts intended to be built in the countryside between Mahon and Alaior (Biniai, Rafal Rubí and l’Argentina) aroused huge controversy during the time of the last government because they were considered out of proportion for the requirements of these places. The one at Biniai was never started but works began at the other two points. In both those cases, the structures were initiated, although, however, there is no road going over either of them, nor is there any banking, nor the four entry and exit lanes nor the asphalting. So a reorganization to make simpler junctions does not imply more costs, but, probably, fewer. Next, the Consell Insular (the Island government) has to make a decision on these works. Signatures are being collected in support of the declaration of intent which asks that new works should not be out of proportion to the areas. To these earlier warnings, was added a decision by the Commission for the Environment advising that at l’Argentina some drainage would have to be made below the high structure where there was none. The conclusion of the Commission was that any idea of a double level roundabout should be abandoned. In the case of Rafal Rubí, an appraisal of the landscape made by one of the most prestigious landscape designers of Spain, asks that something be done about the height to avoid the bad impact on the surroundings of the two prehistoric navetas. Technical solutions vary according to context. For example, the es Tudons naveta is the most visited ancient site of Menorca (with about 10,000 visitors annually). Visitors arrive mostly in cars driven by tourists as well as by buses. There is a waiting area and there has never been any access difficulty because there is sufficient visibility. In Mallorca, the dual carriage way (of four lanes) between Palma and Manacor has resolved the problems of intersections with roundabouts at road level. Above all, it should be remembered that Menorca has the safest roads in the Balearics. We hope that you will send this notification to your friends. They do not have to be locals to sign the declaration. We also have the declaration on paper if you prefer to sign by hand. It will then be incorporated on the final list. Now is the time to give your support.